Stars like our Sun eject large amounts of gas and dust into space, containing various elements and compounds. Asymptotic giant branch -- AGB -- phase stars, near their end of life, are particularly significant sources of such substances in our galaxy. Formation of dust around AGB stars has been considered to play an important role in triggering acceleration of stellar wind, but the detailed mechanism of this acceleration has not been well explained. "Previously, there was a limit to how well we could observe dust forming regions close to stars," explains Takigawa. 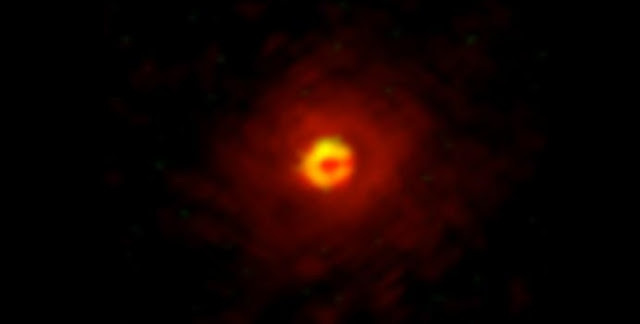 "Now, thanks to the high spatial resolution of ALMA, we can obtain images of gases in these regions in finer detail. So we pointed ALMA toward an aluminum oxide-rich AGB star, W Hydrae." Gas molecules aluminum monoxide and silicon monoxide -- AlO and SiO -- eventually form aluminum oxide and silicate dust. The team observed that AlO was distributed within three stellar radii of W Hydrae, which was surprisingly similar to the previously-observed dust distribution. Meanwhile, SiO was detected beyond five stellar radii, and moreover 70% remained gaseous, without forming into dust. "These results indicate that as aluminum oxide grows and accumulates near a star, the addition of a small amount of silicate dust may trigger wind acceleration," elaborates Takigawa. "This decreases gas density, suppressing further silicate dust formation." "This may explain the presence of aluminum-oxide-rich but silicate-poor AGB stars." These new results shed light not only on the dynamics of gas and dust surrounding stars, but also on the importance of studying both together. The team plans to continue using ALMA to elucidate gas and dust dynamics in the universe.